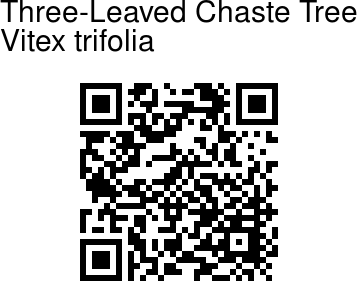 Three-Leaved Chaste Tree is a large coastal shrub or small tree, less that 5 m in height with the stems covered by soft hairs (tomentose). The leaves are oppositely arranged along the stems, simple or trifoliate with 3 linear leaflets which range between 1 -12 cm in length. The upper surface of the leaves are green and the lower surface grayish green. 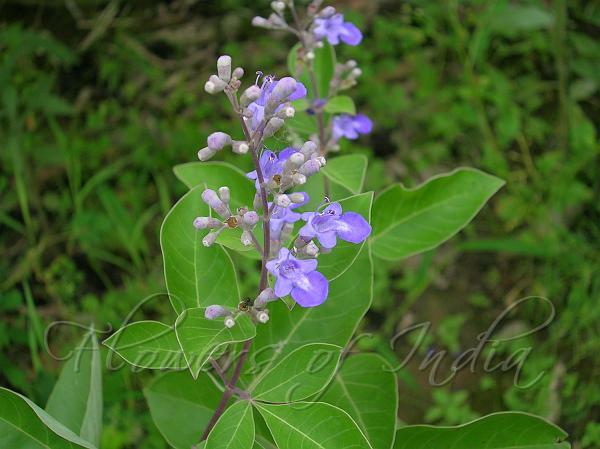 The flowers are born in panicles or clusters up to 18 cm in length. Individual flowers have purple to violet two-lipped corollas that are approximately 5 mm long. The stamen are in two pairs and the ovary is superior, or develops above the corolla. The fleshy fruits are about 6 mm in diameter and contain 4 small black seeds.